In 1998, the Pokémon anime made the leap from television sets to the big screen with Mewtwo Strikes Back. To promote the then-upcoming film, a five-part radio drama entitled The Birth of Mewtwo was produced to reveal the origins of the film’s star. The production expanded on the film’s backstory, showing events and characters never depicted in the anime, games, or movies. 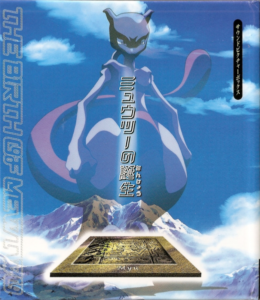 A short film adaptation of the drama was later created and added to television airings of Mewtwo Strikes Back (American audiences wouldn’t see it until it was included as an extra on the DVD release of Mewtwo Returns), but several characters and events were left out. Unfortunately, the radio drama itself was never adapted for English audiences and never American reached shores outside of fan translations of the script. Theditor and I have teamed up to produce an English-language adaptation, entitled The Birth of Mewtwo: Lost Creation, using a script translation hosted by Copy Cat. This won’t be just a straight adaptation, though. We rewrote the script for thematic clarity and cultural elements as well as incorporated elements from the video games, such as replacing references to real-world places with in-game locations. Eighteen years of new revelations about the world of Pokémon have come along since the original radio drama, and we’ve updated the story of Mewtwo to reflect that. Keeping in line with the original production, The Birth of Mewtwo: Lost Creation will be divided into five chapters. Each narrator/character will be voiced by someone, mixed with sound effects and music, and and will be posted on YouTube and downloadable in podcast format. Currently we are seeking actors and musicians to contribute to the project. Actors will of course be needed to breathe life into these characters and musicians will be needed to create an immersive audio experience for this untold story of the most famous legendary Pokémon. If you are interested in acting: Send me an email at thedrillsoul@gmail.com or use the website’s Contact page. Inform me of the character you are interested in and I will give you an audition piece for the part(s) you are trying out for. Read the audition piece(s) for the character(s) you want to audition for and email us either an MP3 file or upload the file to YouTube, Sound Cloud, or Drop Box. We don’t expect perfection in terms of recording quality, but the cleaner it sounds, the happier we are! When reading the character(s), remember to show opinion and personality into each. Give it your own spin and interpretation! Read it how you would read if you already had the role, everything you think this character is and isn’t. Remember to have fun! One additional note about voice acting parts is that if you live in or near the Raleigh/Durham/Chapel Hill area of North Carolina or the Pittsburgh area of Pennsylvania, auditions and recordings can be done in person with myself or Theditor. This is helpful if you do not have your own recording equipment or software. If you are interested in sending music: Use the contact methods described above. The most common music needed will be both eerie music for laboratory scenes but also mystical, ethereal music, but if you have a song that you think would work with the story, feel free to send it in! Remember, all music sent must be royalty free! This is a non-profit, fan-made collaboration and thus we can’t afford royalties. For an easier way to audition, check out our Casting Call Club page. MEWTWO – Masculine voice. A vengeful and lost scientific creation searching for his place in the world. He shoulders desperation to learn his purpose but also harbors rage and great psychic power. Available! GIOVANNI – Male, 30s/40s, the devious, scheming head of Team Rocket. He is ruthless in his criminal dealings yet tales gleeful pride in the illegal nature of his business. Available! MIYAMOTO – Female, 20s/30s, an absentee mother and high-ranking member of Team Rocket with an inflated opinion of herself. She becomes obsessed with the search for Mew, spending decades prowling the jungles and mountains of a remote tropical island. Available! MADAM BOSS – Female, 40s, former head of team rocket and mother of Giovanni, a shrewd business woman aiming to maximize profit and minimize cost. Available! MEW – Feminine voice. A legendary Pokémon, said to be the rarest in the world, lighthearted, airy, and curious. Available! DOCTOR FUJI – 40s, A brilliant scientist obsessed with resurrecting his daughter through cloning. He approaches his work with a calm and logical attitude but that persona unravels as desperation to resurrect his dead daughter consumes him. Available! AMBER – Female, preteen. The disembodied spirit of Doctor Fuji’s daughter, whom he lost in a car crash years ago. She is upbeat and cheerful despite living an existence confined to a laboratory incubation tube. Available! COMPUTER – Robotic voice of Doctor Fuji’s laboratory computer. Unemotive and cold. Speaks with the voice of Amber. YOUNG MEWTWO – Young boy’s voice. Anxious and curious about his origin and existence. Can be voiced by a female. Available! BULBASAUR-TWO, CHARMANDER-TWO, SQUIRTLE-TWO, AND PIKACHU-TWO: Other Pokémon clones. Can be voiced by a man or woman. Available! RESEARCHER – Lab assistant to Doctor Fuji. Can be a man or woman. Available! TRAINER – Male, teenager/20s. An eager Pokémon trainer that attempts to challenge Mewtwo in battle. Available! This is a fan-made project, and as such, it is a non-profit venture. This is important to note considering Nintendo’s takedown of Pokémon Prism. We will not be able to provide compensation but you will be credited for your contribution and this is a great way to get started with voice acting if you are interested in entering the field. Contact me if you have any questions. Stay tuned for more updates on this project! We are still in the early stages of production, but we expect The Birth of Mewtwo: Lost Creation to be ready for your listening pleasure some time in 2017. We’re excited to begin this project and hope you’ll come along for the ride!